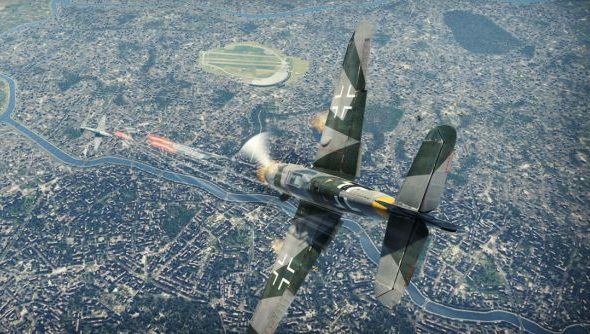 Want to see the pitch for War Thunder? It’s a couple of years late, but the live action trailer debuted at Russian Comic Con this weekend does the trick. True to the tanking-and-banking game’s remit, we’ll travel from the trenches up between the clouds, onto the unfurnished first-floor of the atmosphere – before dropping back down again with the bombs. Named Victory is Ours, the trailer flits between family photos and pornographic slow-mo shots of mid-air ammunition. There’s a slightly uncomfortable juxtaposition between Gaijin’s fondness for war machines and their “respect for the heroism of all the participants of the Great Patriotic War” – but it’s clear their intentions are good. The scene is the fields of outlying Moscow, where the German army suffered its first major defeat. The real fight lasted six months; Gaijin do their best with four minutes. There you have it: a collage of first-person misery, Max Payne bullet time, Skywalker dogfighting, and upper lips so stiff they could do with fabric softening. Would you say the video’s representative of what it’s like to play the game? The air-to-ground assaults of War Thunder update 1.43must have made some of its scenes commonplace.